Update Thurs 8:30am: Stock is already exhausted, with the Play Store advising users to check back soon. Well done all you Nexus buyers that got in early! 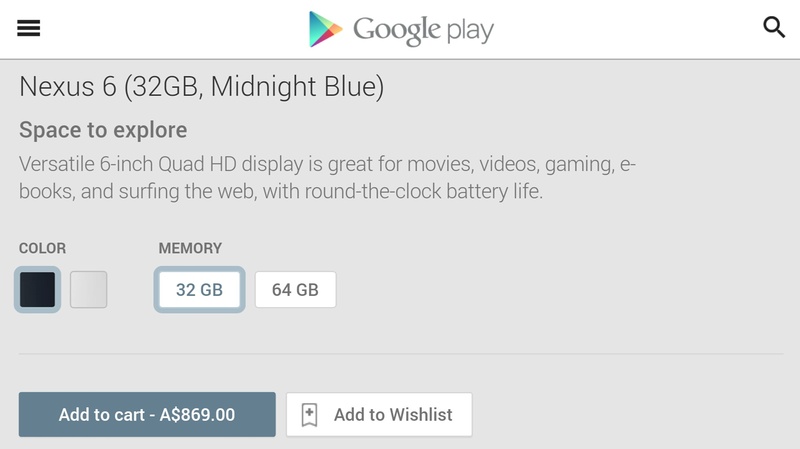 Update 6:30am: As you can see above, the Nexus 6 is now available for purchase online via the Play Store. While the Nexus 6 is on-sale, again Google has yet to provide cases, with the Stand Folio Case for Nexus 6 and Naked Tough Case for Nexus 6 still not available for order, though this may change later today. For now, head on over to Google Play and get your order in quickly, judging by the rush in the US, stocks may not last. Whay a terrible product launch…. I actually don’t care too much at the moment. I feel like a sucker waiting with the page refreshing for this thing. I’d love to walk into jb hifi and just buy it. I feel like this is nearly as bad as OnePlus in getting this out. #$&%=+*$#!!!!! Lolz! Just saw it go up 32gb blue version. I was just checking the page. I thought heh that’s funny. I want the 64 go version. Now it’s gone like in all of 2 seconds. Does anyone know if the 64gb versions have gone up at all? Nah, only 32GB Blue were available. Was up 4:30am with the young fella and it wasn’t available. Woke up 8:15am, out of stock. Fortunately, must have ordered the single unit that became available at 8:25am. yeah they were available at about 830 no issue, I don’t want one mind you, too big and expensive but for people like yourself who do, congrats !! Thanks Chris! Make no mistake though, for me the price was still a hard one to swallow! Unlucky! Google is out of inventory. They’re also advising that the Nexus 6 will be available from JB HI-FI. I’ll call them today to check when will they have it stock. Hi Mahmoud, just curious, how did you go with JB? Thankfully I get up early – cheers!